People who smile more often give off the impression of being more confident and content in life. When you are trying to succeed in life, it is important to look and feel confident so you can surpass your expectations and other's expectations of you. Allow us to give you more confidence and success by providing you with dental implants that perfectly fill in your already beautiful smile. The procedure to receive dental implants typically only takes two to three visits, and within a few months, you will have strong, working teeth again. The artificial tooth roots that hold your replacement teeth in place are made of a titanium metal that fuses with your jawbone to create the strongest possible substitute for missing teeth. Dental implants can act on their own as replacement teeth, or they can be used to support dentures or dental bridges as needed. The options and benefits of dental implants are numerous and can change your life for the better in a few simple visits to our Plano office. 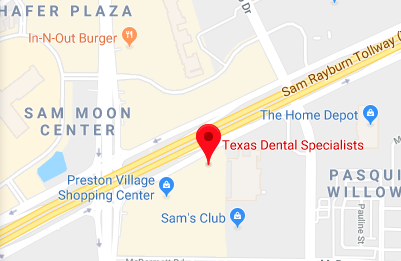 When you get dental implants in Plano at our dental office, you can rest easy knowing that you are truly making the right decision. There is no reason to let missing teeth alter your lifestyle. The unfortunate fact is that many people do not know that they can take advantage of dental technology to get artificial teeth that look, feel, and even act exactly like natural teeth. Our dental implants in Plano, which we install at our dental office, serve multiple purposes. First, the dental implants work to give you back a fully-functional smile that has serious implications on your lifestyle. Second, is that these implants actually work to restore your jawbone by acting like a natural tooth. When the body starts to resorb the jawbone, the bone itself starts to deteriorate. The deterioration causes it to fail its secondary function, which is to support the structural integrity of the face and bite. You may notice that the chin can shrivel up and the lips pull inwards with age. This is as a result of the jawbone deteriorating which leads to the collapse of the posterior bite or the entire facial structure. Dental implants in Plano is a way to prevent this from happening and ensures that you won't develop a witches chin. To learn more about how dental implants can preserve and restore your facial structure, give us a call. Dental implants are the most revolutionary and secure way for you to replace lost teeth. Tooth loss is quite a devastating experience. Since teeth help with critical functions such as biting, chewing, and even the enunciation of words, losing a tooth can be traumatic. With an implant, you will be replacing your tooth with a device that looks, feels, and even acts exactly the same as the natural tooth you just lost. For those who have been using some other device, such as dentures, there is literally no comparison. Once you have your dental implants installed, you can wave goodbye to the messy adhesives and complicated cleaning routines. In exchange, you will have a surgically installed tooth that you brush, floss, and never remove. Dental implants are actually the tiny screw which is placed into your jaw and provides the support for a perfect crown above the surface. This crown is designed to look and feel exactly like your regular teeth, hence giving you the pleasure of a perfect replacement. The dental implants, however, are doing even better below the surface. All dental implants are made of titanium since scientists and dentists discovered that titanium has a unique quality that makes it perfectly suited for prosthetic devices. Titanium has the ability to meld with the body’s organic matter through a process known as osseointegration. In the case of an implant, this means that the tiny titanium screw literally becomes a replacement for the root of your lost tooth. The device convinces the body that it is part of the mouth to such a great degree that the body actually supports the device the same way as it would a natural tooth. What this does for your implant is provides and amazing among of security and stability. For the jaw, having a replacement tooth to provide stimulus means the jawbone can actually grow, develop, and sustain. The jawbone has a symbiotic relationship with the teeth. The jaw provides stability and security, by providing a strong anchor for the teeth. In exchange, the teeth provide stimulation to the jawbone, which is vital to its development. The teeth provide this stimulation every time you bite down on something or chew your food. This relationship is supported by the body since the mouth is the first step in the digestive process. However, when you lose a tooth or teeth, the stimulation to the jawbone is lost which causes the body to start a process known as resorption. Essentially the body starts to leach the calcium and other vital minerals from the jaw and reallocating it to other areas. This causes the jawbone to start to dissolve. A dissolving jawbone is not good for your facial structure, which depends on the jaw for its structural integrity. When the jawbone doesn’t have enough bone mass to support the bite or lower face, it can fundamentally change how a person looks by adding wrinkles or causing their lips to curl in. The good news is that with the dental implants we use, none of this will happen, and you can maintain a youthful appearance. When considering dental implants what are the important factors that you should take into consideration? Using dental implants to replace teeth that have to be extracted or have been lost due to some other cause is growing increasingly common. As fewer doctors view this procedure as cosmetic, more dentists are offering the ability for their patients to get dental surgery to place implants. As a direct result of over 3 million people getting implants in the United States, and the growing commonness of this avenue of treatment, it has become more important than ever for you to ask the right questions. This way you can be sure that dental implants are right for you. Are you ready for implants? This is a question you will need to discuss in some detail in our dental office. While there are no prerequisites for implant dentistry, it is always a good idea to know where you stand with regards to your oral health. We can give you information as to the condition of your mouth and overall health prior to proceeding. One of the few risks with dental implants is the risk of infection and so you need to make sure that you have no gum diseases, cavities, or other potential avenues where an infection might creep into your gums. We will need to look at your oral health history, as well as any relevant medical history to ensure that you are not at risk for complications. Can you afford dental implants? While there is a distinct change in the cultural view of implants, with doctors and insurance companies now seeing them as a long-term fix to certain dental challenges instead of purely cosmetic solutions, there is still a significant cost associated with the procedure. On average, a single tooth implant can cost anywhere from $1,500 to $3,000 plus an additional $500 to $3,000 for the crown which covers the implant. It is critical to note that this is for a basic, no complications, dental implant. As the process gets more complicated and if it needs to include things like extractions the price goes up and can cost as much as $10,000. We will, however, discuss pricing and various cost saving measures with you. We can also provide a payment option or financing through a third party. Additionally, you may be able to request an allowance from your insurance company, which will allow you to proceed with getting a dental implant. There are other factors to consider when you are getting dental implants. These include things like time. They typically take anywhere from three to six months to fully complete the process during which time you will need to visit our office for checkups and outpatient treatment as well as the surgery itself. While the time required isn’t colossal, you should bear that in mind when choosing when to get your dental implants. Giving yourself adequate time for healing after the surgery, and being able to follow up are critical to the success of the implant itself. We can work with you to plan around your schedule so that you can get the medical care that you need.